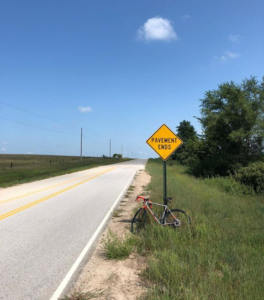 An article by Janine Copple Comments Off on Trail Ramblings: Street Design, Gravel Worlds, And More. First, thank-you to everyone who came out to view and give feedback for the on-street bike plan unveiling today at Turbine Flats. 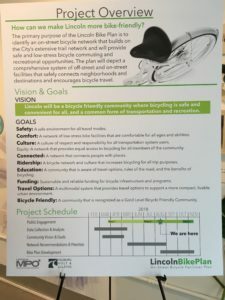 The plan showed proposed connections and identified plans for the future growth of an on-street bike network. 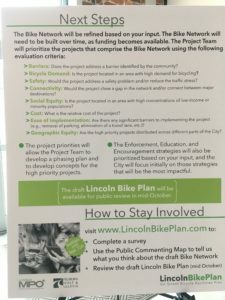 Many staff consultants were there to answer, and ask, questions of Lincoln riders. I believe that the future belongs to us, but we have to speak up and work with infrastructure planners, workplace health educators, law enforcement and motorists to bring people around to the idea that better bicycle infrastructure is for the greater good, and that it is possible to change people’s habits. Unfortunately there are those who believe that motorist behavior will not change, and that we shouldn’t expect anything better. Also, that we should limit our expectations and be content with less street access. The more people ride, the safer the streets become for us, but many don’t ride because they don’t feel safe. Strangely, In China, though motorists participate in a free-for-all on the roadways with very little law enforcement, I did not feel more in danger there than here. After a week or so of acclimation to the local driving habits, which was at times terrifying, I learned that those drivers were at least alert and expecting to share the road with other forms of transportation like three-wheelers, scooters, and bicycles, even if they didn’t always like it. Legally, they would be automatically at fault in an accident with a more vulnerable road user. Here, they just seem to not even be watching for anything other than another car in the roadway. I sometimes feel looked through, rather than seen, and the law, incredibly, seems skewed to protect the motorist in a crash (He came outta nowhere, officer!). 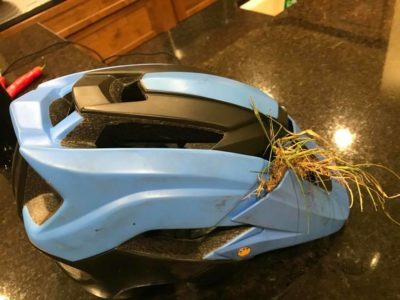 A cyclist I know was hit Saturday on the First Street trail north of Cornhusker highway by an inattentive motorist who didn’t look for anyone at the trail crossing before proceeding into the street. He’s alright but his bike is totaled. Would a sign have helped? A flashing light? There are many conflict points along some trails and motorists have to learn to check for trail users. Cyclist movement is further discouraged by the “resting red” lights at trail crossings, even when parallel motor traffic has a green light. These kinds of defaults further highlight how bicycle transportation is subtly discouraged. As people who bicycle, we need to be heard, even if we don’t always agree on the best way to solve a problem. We should at least be able to agree on the problems. 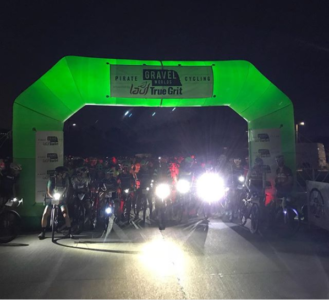 Now onto the big bike event of the year, Gravel Worlds, which happened this past Saturday. You may have noticed some extra-fast looking cyclists kitted-up and cruising around on Lincoln trails Friday. Every year the race grows bigger, with 510 registered entries in the 150 mile and 75 mile privateer races from many states and a handful of foreign countries. Congratulations to everyone who rode. As one experienced rider said, “I’ve gotten 5% faster since last year, but the field got 10% faster.” I agree. It was a tough day for me out there, though the weather was beautiful, as I was feeling a little “off” on race day. At about mile 100 I started to feel better, was able to eat more, and did finish, though with my worst time ever. Someone said they thought the route planner (Schmitty) took all the highest elevations in the area and connected them. It was a beautiful route, you could see for miles from the tops of those “hills”, with nearly 10,000 ft. of climbing. So much climbing in fact that a special climber’s jersey was awarded to the best male and female climbers of the “Denton wall” in honor of Randy Gibson, who holds the KOM for the wall (king of the mountain). 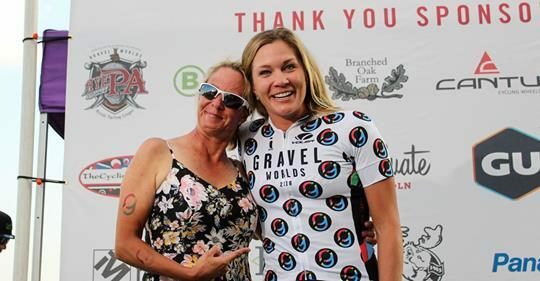 Christy Gibson awarded the jerseys, with an additional tribute by Sofia Gibson in honor of Randy Gibson, killed by a drunk driver while riding last fall. Photo Credit: Pirate Cycling League. Everyone who rides has a tale to tell, whether they finish or not. A 20 mile ride may be as epic to one rider as 150 race is to another. It’s all relative, so don’t feel like the shorter rides aren’t an accomplishment, too. But navigating the rolling gravel sea around Lincoln is one of the most epic rides I know.